Diesel exhaust particles (DEP) have strong, selective Th2 adjuvant activity when inhaled with conventional Ags. We used a novel technique for measuring in vivo cytokine production to investigate possible mechanisms by which DEP might promote a Th2 response. Injection of DEP i.p. stimulated IL-6 secretion, but failed to increase IL-4, IL-10, or TNF-α secretion, and decreased basal levels of IFN-γ. When injected with or before LPS, DEP had little effect on the LPS-induced TNF-α responses, but partially inhibited the LPS-induced IL-10 response and strongly inhibited the LPS-induced IFN-γ response. DEP also inhibited the IFN-γ responses to IL-12, IL-12 plus IL-18, IL-2, and poly(I · C). DEP treatment had little effect on the percentages of NK and NKT cells in the spleen, but inhibited LPS-induced IFN-γ production by splenic NK and NKT cells. In contrast, DEP failed to inhibit the IFN-γ response by anti-CD3 mAb-activated NKT cells. Taken together, these observations suggest that DEP inhibit Toll-like receptor ligand-induced IFN-γ responses by interfering with cytokine signaling pathways that stimulate NK and NKT cells to produce IFN-γ. Our observations also suggest that DEP may promote a Th2 response by stimulating production of inflammatory cytokines while simultaneously inhibiting production of IFN-γ, and raise the possibility that the same mechanisms contribute to the association between DEP exposure and asthma. The incidence of allergic disorders and the morbidity and mortality caused by these disorders increased substantially in developed countries during the second half of the twentieth century (1, 2, 3, 4). There are probably multiple reasons for this increase, including improvements in vaccines, antibacterial drugs, and hygiene that decrease bacterial and parasitic infection and modify normal intestinal flora; changes in diet and activity; decreased family size; and a change in exposure to pollutants created by fuel combustion (1, 2, 3, 4, 5, 6). With regard to the last possibility, any increased contribution of combustion-associated pollutants to allergy may reflect a qualitative change in pollutant exposure caused by a shift from the use of wood and coal to the use of petroleum for energy, rather than from a quantitative increase in exposure to combustion-related pollutants (1, 2, 3, 4, 5, 6). Particular attention has been paid to diesel exhaust particles (DEP),3hydrocarbon liquids adsorbed to microscopic particulate carbon cores emitted by diesel engines. DEP exposure has been linked to the incidence of allergic disorders, particularly asthma, in epidemiological studies, and inhaled and injected DEP have been shown to be a potent adjuvant for the development of an allergy-related Th2 immune response in animal studies (7, 8, 9, 10, 11, 12). The precise mechanism by which DEP exposure promotes allergic responses is not entirely clear, although oxidant activity of the adsorbed hydrocarbons, rather than properties specific to the carbon core, appears to be involved (13, 14, 15, 16). In this regard, hydrocarbon extracts of DEP have been reported to induce IL-4 production by cultured human basophils and promote a murine in vivo Th2 response (17, 18, 19), and inhalation of DEP, or other oxidants, has been reported to induce production of GM-CSF, which can costimulate a Th2 response (20, 21). However, the same cells of the innate immune system that produce these inflammatory cytokines also produce cytokines such as IL-12 and the type I IFNs, which promote Th1 differentiation and inhibit Th2 responses by stimulating IFN-γ production (22, 23, 24). Thus, the mechanism by which DEP promote a Th2 response, rather than a Th1 response, remains uncertain. To investigate this issue, we evaluated whether DEP can contribute to the elicitation of a Th2 response by directly inducing IL-4 production or by inhibiting the production of IFN-γ. We find that DEP strongly suppress cytokine- and Toll-like receptor ligand (TLRL)-induced IFN-γ responses by NK and NKT cells through a mechanism unrelated to oxidant activity, and suggest that this effect of DEP may contribute to their ability to promote a Th2 response and allergy. Female BALB/c and C57BL/6 mice were purchased from National Cancer Institute (Frederick, MD) and were used at age 2–4 mo. All experiments used five mice/group, unless otherwise noted in the figure legends. DEP were a gift from M. Sagai (Aomori University of Health and Welfare, Faculty of Health Sciences; Aormori, Japan). These particles were generated by a light-duty, four-cylinder diesel engine (4JB1 type; Isuzu Automobile, Tokyo, Japan) using standard diesel fuel, as previously described (25, 26). This preparation has been used in many other studies of the biological effects of DEP (10, 27, 28, 29) and is similar to other DEP preparations in its mean particle size (∼2 μM diameter) and the qualitative nature of its hydrocarbon content, which includes polyaromatic hydrocarbons and oxidized derivatives of p-aminohippuric acid, such as quinines; however, different engines, different loads, different sources of diesel fuel, and different running cycles all have quantitative effects on the precise hydrocarbon composition of DEP (30, 31). Murine cytokine standards (IL-2, IL-4, IL-6, IL-10, IFN-γ, and TNF) and mAbs used to assay for these cytokines by ELISA and the in vivo cytokine capture assay (IVCCA) were purchased from BD PharMingen (San Diego, CA). PE-labeled anti-NK1.1 and DX5 mAbs were also purchased from BD PharMingen. Human IL-2 was obtained from the National Cancer Institute. A kit for measuring levels of IL-12 p70 in mouse serum was purchased from R&D Systems (Minneapolis, MN). N-acetylcysteine (NAC), activated charcoal powder, and Salmonella typhimurium LPS were purchased from Sigma-Aldrich (St. Louis, MO). Poly(I · C) was purchased from Calbiochem (La Jolla, CA). An immunofluorescence-based kit for measuring IFN-γ production by individual cells in culture (mouse IFN-γ secretion assay detection kit) was purchased from Miltenyi Biotec (Auburn, CA) and was used according to the manufacturer’s directions. DEP were suspended in PBS at a concentration of 10 mg/ml by sonicating for 3 min with a Branson sonifier, using the number 7 setting. The IVCCA (32, 33) was used to measure in vivo production of IL-2, IL-4, IL-6, IL-10, IFN-γ, and TNF. Briefly, mice were injected i.v. with one or more biotin-labeled neutralizing anti-cytokine mAbs (10 μg each) simultaneously (unless otherwise noted in the figure legend) with the injection of a stimulus for cytokine production, such as LPS. The anti-cytokine mAbs capture their ligands and prevent their catabolism, use, and excretion, so that they accumulate in serum. Mice were bled 1 day later, and serum levels of cytokine/biotin/anti-cytokine mAb complexes were determined by ELISA, using microtiter plate wells coated with Abs that bind cytokine epitopes that are not blocked by the injected anti-cytokine mAbs. Bound complexes are detected by a streptavidin-enzyme conjugate, followed by a luminogenic substrate. Measurements performed with this technique, which generally increases the sensitivity of cytokine detection ∼100-fold, are highly specific and are linearly related to the quantity of cytokine produced (32, 33). TRIzol reagent (Life Technologies, Frederick, MD) was used to isolate RNA from individual mouse spleens. mRNA was reverse transcribed for PCR amplification with an Omniscript RT kit (Qiagen, Valencia, CA). Quantitation of IFN-γ mRNA by real-time PCR was performed using TaqMan assay reagents for murine IFN-γ and for 18S rRNA (standard) (Applied Biosystems, Foster City, CA) and an iCycler (Bio-Rad, Hercules, CA), according to the manufacturers’ directions. Single cell suspensions prepared from mouse spleens were stained with 1 μg of each PE- or FITC-labeled mAb for 30 min on ice in a total volume of 100 μl of HBSS plus 10% FBS and 0.2% NaN3. After washing, cells in a lymphocyte plus macrophage scatter gate were analyzed for FITC and PE fluorescence with a BD Biosciences (Mountain View, CA) FACSCalibur. Differences between groups were tested for significance by a two-tailed t test program (EpiStat, Decatur, GA), according to the manufacturer’s directions. The IVCCA was used to evaluate systemic in vivo cytokine responses to DEP. Mice injected a single time i.p. with 2 mg of DEP in saline demonstrated increased IL-6 production, but no increase in IL-4 or IL-2 production (Fig. 1⇓, upper panel). In contrast to the increased production of IL-6, TNF production was not affected (Fig. 1⇓, middle and lower panels) and IFN-γ levels were considerably decreased in some experiments (Fig. 1⇓, middle panel); this decrease was ∼75% when mice were injected with DEP on 3 successive days (Fig. 1⇓, lower panel). DEP stimulate IL-6 production and inhibit basal IFN-γ production. BALB/c mice were injected i.p. once with saline or 2 mg of DEP suspended in 0.2 ml of saline (upper and middle panels) or daily for 3 consecutive days with saline or 2 mg of DEP (lower panel). Cytokine production was determined by IVCCA in this and in subsequent figures, unless otherwise noted. Geometric means and SEMs are shown in this and in subsequent figures. Statistically significant (p < 0.05) changes are indicated in this figure and in subsequent figures by the following symbols: ∗, significantly increased as compared with the untreated group; †, significantly decreased as compared with the untreated group; +, significantly increased as compared with the stimulated group; #, significantly decreased as compared with the stimulated group. To determine whether DEP suppress TLRL4-induced IFN-γ production, we evaluated the ability of a single i.p. injection of DEP to inhibit the IFN-γ response to LPS. A single injection of 100 μg of LPS greatly increased the production of IL-6, IL-10, TNF, and IFN-γ during the subsequent 24 h. Injection of 2 mg of DEP 2 h before LPS administration completely suppressed the LPS-induced IFN-γ response and partially suppressed LPS-induced IL-10 production, but had no effect on LPS induction of IL-6 or TNF production (Fig. 2⇓A). DEP suppressed the LPS-induced increase in IFN-γ mRNA (Fig. 2⇓B), although not as completely as it suppressed IFN-γ secretion. DEP suppression of IFN-γ secretion was dependent on molecules adsorbed to the DEP carbon cores, because injection of mice with activated charcoal, which mimics the carbon cores of DEP, but lacks the adsorbed hydrocarbons, had no effect on LPS-induced IFN-γ secretion (Fig. 2⇓C). DEP inhibit TLRL- and cytokine-induced IFN-γ responses. A, BALB/c mice were injected i.p. with saline or with 2 mg of DEP in saline, followed 2 h later by i.p. injection of saline or 100 μg of S. typhimurium LPS. B, BALB/c mice (5/group) were injected i.p. with saline or 2 mg of DEP and 2 h later with saline or LPS. Spleens were removed 4 h later, and IFN-γ mRNA levels were determined by real-time PCR; levels shown are relative to those in saline-treated mice. C, BALB/c mice were injected i.p. with saline or 2 mg of activated charcoal suspended in saline, and 2 h later with 100 μg of LPS i.p. D, BALB/c mice were injected i.p. with saline or 2 mg of DEP. Mice were injected i.p. with saline or 100 μg of S. typhimurium LPS 2 h later and bled 2 h after that. Serum IL-12 levels were determined by ELISA. E, BALB/c mice were injected i.p. with saline, 2 mg of DEP, 1 μg of IL-12, or DEP plus IL-12. F, BALB/c mice were injected i.p. with saline, 2 mg of DEP, 20 ng of IL-12 + 1 μg of IL-18, or with DEP, IL-12, and IL-18. G, BALB/c mice were injected i.p. with saline, 2 mg of DEP, 100,000 U of human IL-2, 1 mg of poly(I.C), DEP + IL-2, or DEP + poly(I.C). Additional experiments were performed to determine whether DEP suppress LPS-induced IFN-γ production by inhibiting LPS-induced production of cytokines that stimulate IFN-γ production, such as IL-12, or the IFN-γ response to such cytokines. DEP suppressed the IL-12 response to LPS by a factor of ∼3 (Fig. 2⇑D), but also, and more completely, suppressed IFN-γ responses to IL-12 and to IL-12 plus IL-18 (Fig. 2⇑, E and F). DEP suppression of IFN-γ production was not, however, limited to inhibition of the effects of IL-12. DEP suppressed the stimulatory effect of IL-2 on IFN-γ production, which is IL-12 independent (34), as well as the stimulatory effect of poly(I · C), which activates IFN-γ production through a mechanism that depends on Toll-like receptor 3 and involves the production of type I IFNs (Fig. 2⇑G) (24, 35). To further characterize DEP suppression of the IFN-γ response to LPS, we evaluated the effect of varying the dose of DEP administered from 0.1 to 2 mg. Although every dose administered suppressed the IFN-γ response, there was a clear dose effect, with the most complete suppression observed at the highest dose (Fig. 3⇓). DEP suppression of IFN-γ production developed rapidly, as it was observed when DEP and LPS were coadministered (Fig. 4⇓, upper panel) and was long lasting, because it was undiminished when LPS was inoculated 4 days after DEP (Fig. 4⇓, lower panel). 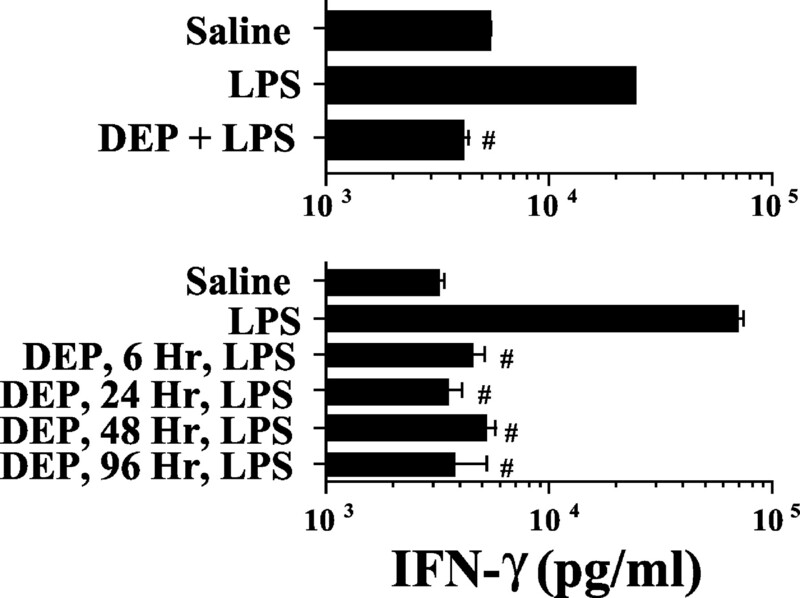 Effect of DEP dose on inhibition of LPS-induced IFN-γ production. BALB/c mice were injected i.p. with saline or 0.125–2 mg of DEP suspended in saline, followed 2 h later by 100 μg of S. typhimurium LPS. 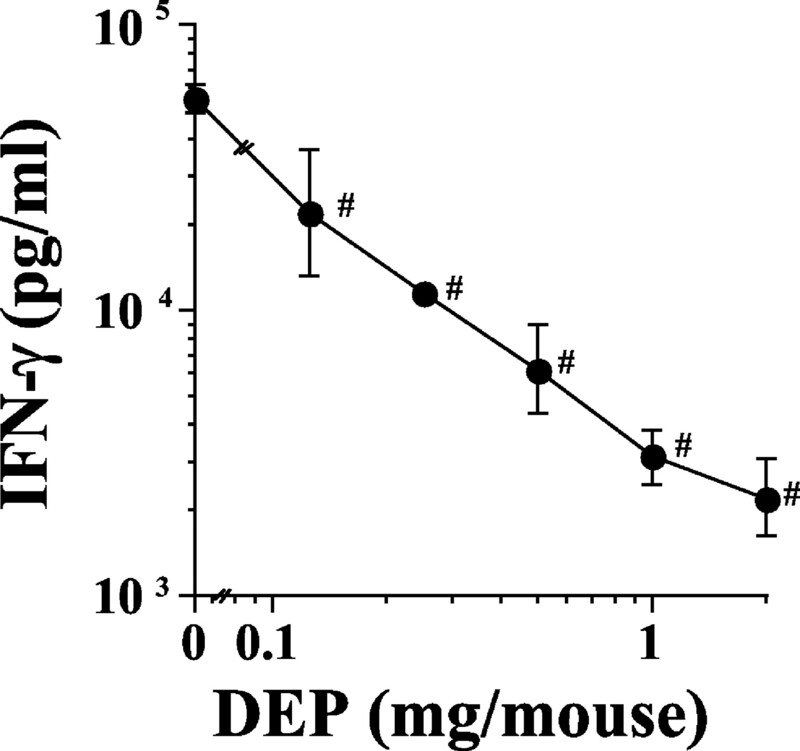 Kinetics of DEP inhibition of LPS-induced IFN-γ production. BALB/c mice were injected i.p. with saline, 100 μg of S. typhimurium LPS, or LPS + 2 mg of DEP (upper panel), or with DEP 6–96 h before injection of LPS. To characterize the cell types involved in DEP suppression of IFN-γ production, we evaluated DEP effects on the two cell types that have been most closely associated with rapid production of IFN-γ: NK and NKT cells (36). The initial experiment was performed with C57BL/6 mice because NK1.1, the standard marker for identifying NK and NKT cells, is not expressed in BALB/c mice (37). DEP injection caused a significant decrease in spleen cell number, but has little effect on the percentages of NK or NKT cells in spleen (Fig. 5⇓A). A second experiment, performed in BALB/c mice, in which DX5, rather than NK1.1, was used as an NK and NKT cell marker, with NK cells defined as DK5+CD3− and NKT cells defined as DX5+CD3+ (38, 39, 40), gave similar results (data not shown). An additional BALB/c experiment, which used DX5 as an NK marker, demonstrated strong DEP suppression of IFN-γ responses made by individual NK and NKT cells following LPS stimulation (Fig. 5⇓B). 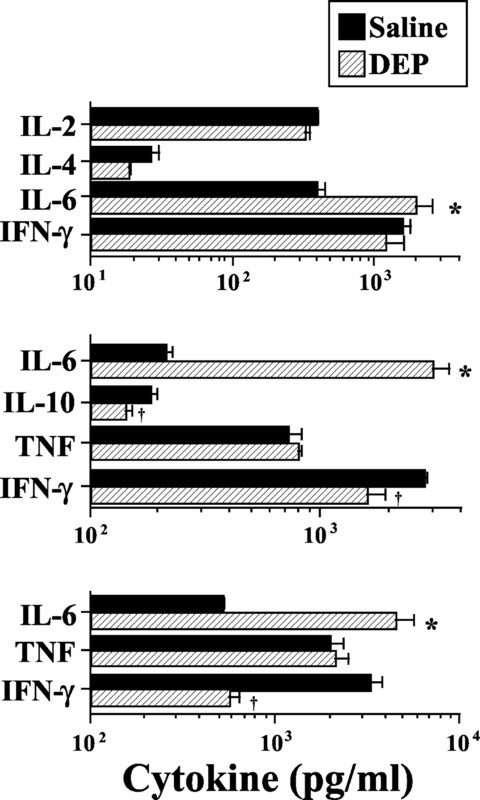 The effect of DEP on IFN-γ production by these cell types probably accounts for most of the suppressive effect of DEP on LPS-induced IFN-γ production, because LPS failed to induce detectable IFN-γ production by B cells or conventional (DX5−) T cells (Fig. 5⇓B). In contrast to the suppressive effect of DEP on LPS-induced IFN-γ production by NK and NKT cells, DEP failed to suppress anti-CD3 mAb-induced production of IFN-γ, or other cytokines, which is NKT cell derived (41) (Fig. 5⇓C). DEP inhibit LPS-induced IFN-γ production by splenic NK and NKT cells. A, C57BL/6 mice (3/group) were injected i.p. with saline, 2 mg of DEP suspended in saline, or 2 mg of activated charcoal suspended in saline. One day later, spleen cells were stained for NK1.1 and CD3, and analyzed by flow cytometry for the percentages of NK (NK1.1+CD3−) and NKT (NK1.1+CD3+) cells. Similar results were observed when BALB/c mice were treated with DEP and stained with the mAb DX5, rather than anti-NK1.1 mAb, to identify NK cells (data not shown). B, BALB/c mice (3/group) were injected i.p. with saline, 100 μg of S. typhimurium LPS, 1 mg of DEP, or DEP + LPS. One day later, spleen cells were stained to detect ex vivo secretion of IFN-γ over a 30-min period, as described in Materials and Methods. Spleen cells were also stained for the expression of a B cell marker (B220), an NK marker (DX5), and a T cell marker (CD3), and were analyzed by flow cytometry for mean fluorescence intensity of IFN-γ staining on B cells (B220+CD3−), conventional T cells (CD3+DX5−), NK cells (CD3−DX5+), and NKT cells (CD3+DX5+). C, BALB/c mice were injected i.p. with saline or DEP. One hour later, mice were injected i.v. with saline or 10 μg of anti-CD3 mAb. Because DEP induction of inflammatory cytokine production and Th2 adjuvanticity have been reported to depend on the oxidant activities of DEP hydrocarbons and are inhibited by administration of the reducing agent, NAC (13, 14, 15), we evaluated whether NAC could similarly block DEP inhibition of LPS-induced IFN-γ production. 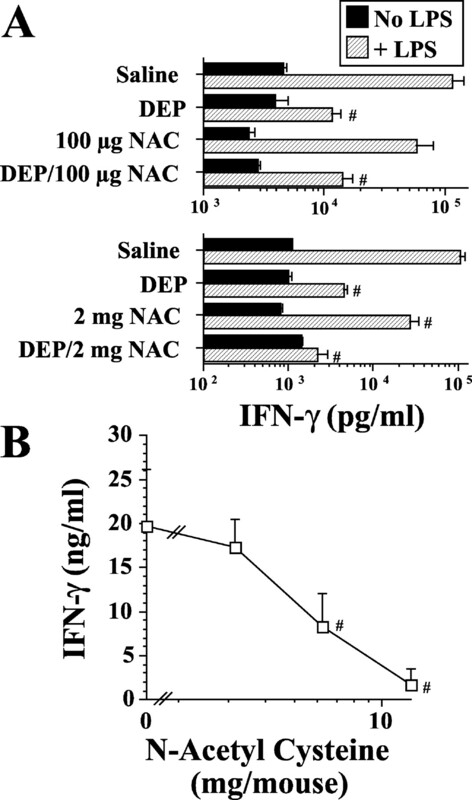 In contrast to its apparent inhibitory effects on DEP adjuvanticity, NAC failed to block DEP inhibition of LPS-induced IFN-γ production; in fact, NAC itself inhibited the IFN-γ response to LPS (Fig. 6⇓). Oxidant activity is not responsible for DEP inhibition of LPS-induced IFN-γ production. A, BALB/c mice were injected i.p. with saline, 1 mg of DEP, and/or 100 μg or 2 mg of NAC. One hour later, some mice were injected i.p. with 100 μg of S. typhimurium LPS. B, BALB/c mice were injected i.p. with saline or with 3–12 mg of NAC. One hour later, all mice were injected i.p. with 100 μg of S. typhimurium LPS. Our observations demonstrate that DEP, in addition to their capacity to induce the production of some inflammatory cytokines, potently inhibit IFN-γ production by NK and NKT cells. Inhibition of LPS-induced IFN-γ production results both from a partial inhibition of the IL-12 response to LPS and more complete inhibition of the IFN-γ response to other cytokines, including IL-2, IL-12, and IL-18. DEP inhibition of IFN-γ production is observed even in the absence of cytokine or TLRL stimulation and is relatively specific, in that DEP fail to suppress TLRL-induced production of some inflammatory cytokines, including TNF, and stimulate production of IL-6. DEP inhibition of IFN-γ production is rapid in onset, long lasting, and dose related. DEP act, at least partially, through an inhibitory effect on steady state IFN-γ mRNA levels, although the greater inhibition of secretion than gene expression (compare A and C in Fig. 2⇑) suggests that DEP may also suppress IFN-γ production through posttranscriptional mechanisms. It is unlikely, however, that DEP have a direct, pan-suppressive effect on IFN-γ transcription or translation, because they fail to inhibit TCR cross-linking-induced IFN-γ production by NKT cells. This observation, and our observation that DEP do not selectively eliminate NK or NKT cells, make it unlikely that DEP inhibit IFN-γ through a toxic effect on these cell types. Thus, it seems most likely that DEP inhibit IFN-γ by selectively interfering with cytokine signaling pathways that can induce IFN-γ production by these cells. Although the mechanism by which DEP may interfere with such signaling pathways is uncertain, it does not seem to be related to the oxidant activity of DEP-associated hydrocarbons, as the suppressive effect of DEP on IFN-γ production is not reduced by pretreatment of mice with the reducing agent, NAC, even at doses of NAC that are themselves suppressive of LPS-induced IFN-γ production. Indeed, the ability of NAC to directly suppress LPS-induced IFN-γ production raises the possibility that NAC suppression of DEP-costimulated Th2 responses reflects a direct suppressive effect of high concentrations of NAC on immune responses rather than specific inhibition of oxidant-associated adjuvanticity. In this regard, it is noteworthy that previous publications that demonstrated NAC inhibition of DEP Th2 adjuvanticity did not test for the possibility that the high concentration of NAC used (∼6–7 mg/mouse) directly suppressed immune responsiveness (15). Against this possibility, however, is evidence that multiple oxidants have proinflammatory effects and that relatively low concentrations of some thiol antioxidants block these effects (42). Taken together with previous observations, our findings suggest that DEP may be a particularly potent Th2 adjuvant for at least two reasons: 1) they can induce the production of cytokines that can costimulate a Th2 response; and 2) they can suppress the production of the cytokines, IL-12 and IFN-γ, that most potently inhibit the Th2 response and the proallergic effects of Th2 cytokines. DEP inhibition of IL-10 production (Fig. 2⇑A) may also promote Th2 responses by preventing IL-10 suppression of Ag presentation. Finally, our observation that DEP inhibit IL-12 induction of IFN-γ production raises the possibility that DEP have a global inhibitory effect on IL-12 signaling, including direct suppressive effects of IL-12 on the Th2 response. It is uncertain, however, how relevant DEP suppression of IFN-γ production is to the association between DEP exposure and the incidence of human asthma. All of our studies have evaluated the effects of 1–3 large doses of DEP, administered i.p., on the systemic response to i.p. administered LPS, while any effects on human asthma would probably result from the cumulative effects of chronic inhalation of relatively low amounts of DEP. We believe that the results of i.p. administration of DEP are likely to be relevant to the effects of inhaled DEP, because i.p. injection of mice with DEP, like DEP inhalation, enhances IgE responses (43, 44). We have examined DEP effects on the IFN-γ response to inhaled LPS and other TLRL. The results of these studies have been negative for a surprising reason: although systemic administration of TLRL induces a strong systemic IFN-γ response, inhalation of the same TLRL induces marked pulmonary production of IL-6, TNF, and GM-CSF, but little or no IFN-γ production (45). Indeed, our studies with inhaled TLRL and infectious agents suggest that the large IFN-γ responses that are produced in the lung during viral, bacterial, and fungal infections probably involve the migration of IFN-γ-producing cells into the lung, rather than the induction of IFN-γ production by cells intrinsic to the lung. We postulate that chronic DEP inhalation will, over time, inhibit systemic IFN-γ responses and/or IFN-γ production by cells that have migrated to the lungs, and this possibility is supported by studies that demonstrate DEP exacerbation of infections with inhaled pathogens that require a Th1 cytokine response for their control (46). Studies that directly test this hypothesis are in progress. ↵1 The studies described in this work were supported by a Merit Award from the Veterans Administration and by Grants RO1 AI45766, RO1 AI55848, and PO1 AI 50495 from the National Institutes of Health. ↵3 Abbreviations used in this paper: DEP, diesel exhaust particle; IVCCA, in vivo cytokine capture assay; NAC, N-acetylcysteine; TLRL, Toll-like receptor ligand. Gergen, P. J., K. B. Weiss. 1992. The increasing problem of asthma in the United States. Am. Rev. Respir. Dis. 146:823. Meza, C.. 1997. Why is asthma becoming more of a problem?. Curr. Opin. Pulm. Med. 3:6. Lemanske, R. F., Jr, W. W. Busse. 2003. Asthma. J. Allergy Clin. Immunol. 111:S502. Doull, I. J., S. T. Holgate. 1997. Asthma: early predisposing factors. Br. Med. Bull. 53:71. Wills-Karp, M., J. Santeliz, C. L. Karp. 2001. The germless theory of allergic disease: revisiting the hygiene hypothesis. Nat. Rev. Immunol. 1:69. D’Amato, G., G. Liccardi, M. D’Amato, M. Cazzola. 2002. Respiratory allergic dieases induced by outdoor air pollution in urban areas. Monaldi Arch. Chest Dis. 57:161. Diaz-Sanchez, D., L. Proietti, R. Polosa. 2003. Diesel fumes and the rising prevalence of atopy: an urban legend?. Curr. Allergy Asthma Rep. 3:146. Polosa, R., S. Salvi, G. U. DiMaria. 2002. Allergic susceptibility associated with diesel exhaust particle exposure: clear as mud. Arch. Environ. Health 57:188. Takano, H., T. Ichinose, Y. Myabara, T. Yoshikawa, M. Sagai. 1998. Diesel exhaust particles enhance airway responsiveness following allergen exposure in mice. Immunopharmacol. Immunotoxicol. 20:329. Suzuki, T., T. Kanoh, M. Ishimori, S. Ikeda, H. Ohkumi. 2996. Adjuvant activity of diesel exhaust particulates (DEP) in production of anti-IgE and anti-IgG1 antibodies to mite allergen in mice. J. Clin. Lab. Immunol. 48:187. Diaz-Sanchez, D., M. P. Garcia, M. Wang, M. Jyrala, A. Saxon. 1999. Nasal challenge with diesel exhaust particles can induce sensitization to a neoallergen in the human mucosa. J. Allergy Clin. Immunol. 104:1183. Diaz-Sanchez, D., A. Tsien, J. Fleming, A. Saxon. 1997. Combined diesel exhaust particulate and ragweed allergen challenge markedly enhances human in vivo nasal ragweed-specific IgE and skews cytokine production to a T helper cell 2-type pattern. J. Immunol. 158:2406. Casillas, A. M., T. Hiura, N. Li, A. E. Nel. 1999. Enhancement of allergic inflammation by diesel exhaust particles: permissive role of reactive oxygen species. Ann. Allergy Asthma Immunol. 83:624. Lim, H. B., T. Ichinose, Y. Miyabara, H. Takano, Y. Kumagai, N. Shimojyo, J. L. Devalia, M. Sagai. 1998. Involvement of superoxide and nitric oxide on airway inflammation and hyperresponsiveness induced by diesel exhaust particles in mice. Free Radical Biol. Med. 25:635. Whitekus, M. J., N. Li, M. Zhang, M. Wang, M. A. Horwitz, S. K. Nelson, L. D. Horwitz, N. Brechun, D. Diaz-Sanchez, A. E. Nel. 2002. Thiol antioxidants inhibit the adjuvant effects of aerosolized diesel exhaust particles in a murine model for ovalbumin sensitization. J. Immunol. 168:2560. Takenaka, H., K. Zhang, D. Diaz-Sanchez, A. Tsien, A. Saxon. 1995. Enhanced human IgE production results from exposure to the aromatic hydrocarbons from diesel exhaust: direct effects on B-cell IgE production. J. Allergy Clin. Immunol. 95:103. Devouassoux, G., A. Saxon, D. D. Metcalfe, C. Prussin, M. G. Colomb, C. Brambilla, D. Diaz-Sanchez. 2002. Chemical constituents of diesel exhaust particles induce IL-4 production and histamine release by human basophils. J. Allergy Clin. Immunol. 109:847. Suzuki, T., T. Kanoh. 1993. The adjuvancy activity of pyrene in diesel exhaust on IgE antibody production in mice. Jpn. J. Allergol. 42:963. Fujimaki, H., F. Shiraishi, Y. Aoki, K. Saneyoshi. 1997. Modulated cytokine production from cervical lymph node cells treated with BP and PCB. Chemosphere 34:1487. Tsien, A., D. Diaz-Sanchez, J. Ma, A. Saxon. 1997. The organic component of diesel exhaust particles and phenanthrene, a major polyaromatic hydrocarbon constituent, enhances IgE production by IgE-secreting EBV-transformed human B cells in vitro. Toxicol. Appl. Pharmacol. 142:256. Ohta, K., N. Yamashita, M. Tajima, T. Miyasaka, J. Nakano, M. Nakajima, A. Ishii, T. Horiuchi, K. Mano, T. Miyamoto. 1999. Diesel exhaust particulate induces airway hyperresponsiveness in a murine model: essential role of GM-CSF. J. Allergy Clin. Immunol. 1004:1024. Ritz, S. A., M. J. Cundall, B. U. Gajewska, D. Alvarez, J. C. Gutierrez-Ramos, A. J. Coyle, A. N. McKenzie, M. R. Stampfli, M. Jordana. 2002. Granulocyte macrophage colony-stimulating factor-driven respiratory mucosal sensitization induces Th2 differentiation and functions independently of interleukin-4. Am. J. Respir. Cell Mol. Biol. 27:428. Gately, M. K., L. M. Renzetti, J. Magram, A. S. Stern, L. Adorini, U. Gubler, D. H. Presky. 1998. The interleukin-12/interleukin-12-receptor system: role in normal and pathologic immune responses. Annu. Rev. Immunol. 16:495. Finkelman, F. D., A. Svetic, I. Gresser, C. Snapper, J. Holmes, P. P. Trotta, I. M. Katona, W. C. Gause. 1991. Regulation by interferon-α of immunoglobulin isotype selection and lymphokine production in mice. J. Exp. Med. 174:1179. Wenner, C. A., M. L. Guler, S. E. Macatonia, A. O’Garra, K. M. Murphy. 1996. Roles of IFN-γ and IFN-α in IL-12-induced T helper cell-1 development. J. Immunol. 156:1442. Sagai, M., A. Furuyama, T. Ichinose. 1996. Biological effects of diesel exhaust particles (DEP). III. Pathogenesis of asthma like symptoms in mice. Free Radical Biol. Med. 21:199. Li, N., M. I. Venkatesan, A. Miguel, R. Kaplan, C. Gujuluva, J. Alam, A. Nel. 2000. Induction of heme oxygenase-1 expression in macrophages by diesel exhaust particle chemicals and quinones via the antioxidant-responsive element. J. Immunol. 165:3393. Bayram, H., J. L. Devalia, R. J. Sapsford, T. Ohtoshi, Y. Miyabara, M. Sagai, R. J. Davies. 1998. The effect of diesel exhaust particles on cell function and release of inflammatory mediators from human bronchial epithelial cells in vitro. Am. J. Respir. Mol. Cell. Biol. 18:441. Fahy, O., S. Senechal, J. Pene, A. Scherpereel, P. Lassalle, A. B. Tonnel, H. Yssel, B. Wallaert, A. Tsicopoulos. 2002. Diesel exposure favors Th2 cell recruitment by mononuclear cells and alveolar macrophages from allergic patients by differentially regulating macrophage-derived chemokine and IFN-γ-induced protein-10 production. J. Immunol. 168:5912. Ichinose, T., H. Takano, Y. Miyabara, R. Yanagisawa, M. Sagai. 1997. Murine strain differences in allergic airway inflammation and immunoglobulin production by a combination of antigen and diesel exhaust particles. Toxicology 122:183. U.S. Environmental Protection Agency Office of Research and Development National Center for Environmental Assessment 2002. Health Assessment Document for Diesel Engine Exhaust: USEPA EPA/600/8-90/057F.01 U.S. Government Printing Office, Washington, DC. Finkelman, F. D., S. C. Morris. 1999. Development of an assay to measure in vivo cytokine production in the mouse. Int. Immunol. 11:1811. Finkelman, F. D., S. C. Morris, T. Orekhova, D. Sehy. 2003. The in vivo cytokine capture assay (IVCCA) for measurement of in vivo cytokine production in the mouse. Curr. Prot. Immunol. :6.28.1. Thornton, S., K. A. Kuhn, F. D. Finkelman, R. Hirsch. 2001. NK cells secrete high levels of IFN-γ in response to in vivo administration of IL-2. Eur. J. Immunol. 31:3355. Varma, T. K., C. Y. Lin, T. E. Toliver-Kinsky, E. R. Sherwood. 2002. Endotoxin-induced γ-interferon production: contributing cell types and key regulatory factors. Clin. Diagn. Lab. Immunol. 9:530. Goo, G. C., J. R. Peppard. 1984. Establishment of a monoclonal anti NK1.1 antibody. Hybridoma 3:301. Lauwerys, B. R., N. Garot, J. C. Renauld, F. A. Houssiau. 2000. Cytokine production and killer activity of NK/T-NK cells derived with IL-2, IL-15, or the combination of IL-12 and IL-18. J. Immunol. 165:1847. Ortaldo, J. R., R. Winkler-Pickett, A. T. Mason, L. H. Mason. 1998. The Ly-49 family: regulation of cytotoxicity and cytokine production in murine CD3+ cells. J. Immunol. 160:1158. Arase, H., T. Saito, J. H. Phillips, L. L. Lanier. 2001. Cutting edge: the mouse NK cell-associated antigen recognized by DX5 monoclonal antibody is CD49b (α2 integrin, very late antigen-2). J. Immunol. 167:1141. Yoshimoto, T., W. E. Paul. 1994. CD4+, NK1.1+ T cells promptly produce interleukin 4 in response to in vivo challenge with anti-CD3. J. Exp. Med. 179:1285. Li, N., M. Wang, T. D. Oberley, J. M. Stempf, A. E. Nel. 2002. Comparison of the pro-oxidative and proinflammatory effects of organic diesel exhaust particle chemicals in bronchial epithelial cells and macrophages. J. Immunol. 169:4531. Finkelman, F. D., E. Clyne, T. Orekhova, J. Bernstein, M. Yang. 2003. Comparison of splenic and pulmonary cytokine responses to S. typhimurium LPS. FASEB J. 17:C253. Muranaka, M., S. Suzuki, K. Koizumi, S. Takafuji, T. Miyamoto, R. Ikemori, H. Tokiwa. 1986. Adjuvant activity of diesel-exhaust particulates for the production of IgE antibody in mice. J. Allergy Clin. Immunol. 79:639. Heo, Y., A. Saxon, O. Hankinson. 2001. Effect of diesel exhaust particles and their components on the allergen-specific IgE and IgG1 response in mice. Toxicology 159:143. Yang, H. M., J. M. Antonini, M. W. Barger, L. Butterworth, B. R. Roberts, J. K. Ma, V. Castranova, J. Y. Ma. 2001. Diesel exhaust particles suppress macrophage function and slow the pulmonary clearance of Listeria monocytogenes in rats. Environ. Health Perspect. 109:515.